The Tampa Bay Lightning have acquired a first-round pick in the 2012 NHL Entry Draft as well as defenseman Sebastien Piche in a three-team trade today, Vice President and General Manager Steve Yzerman announced. The Lightning traded forward Steve Downie to the Colorado Avalanche in exchange for defenseman Kyle Quincey. 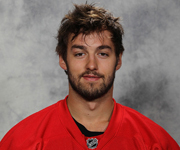 Tampa Bay then sent Quincey to the Detroit Red Wings in exchange for their first-round pick and Piche. The Lightning now have two first-round picks in 2012 along with a maximum of four and a minimum of three selections in the second round. Piche, 6-foot, 202 pounds, has played in 42 career AHL games with the Grand Rapids Griffins, recording five points (0-5-5). This season he has played in 22 games, notching three assists. Piche signed with the Red Wings as a free agent on April 12, 2009. Piche has been assigned to the Florida Everblades of the ECHL.